The Jack & Jones Premium Ben Classic jeans are a grown up pair of skinny fit jeans for men. They are available in custom leg and waist sizes, as well as in an assortment of twenty shades. For our pair we opted for the dark grey denim shade (JOS 371), which have a subtle blue tint to them, with the size of waist being 30” and the length 32”. The price ranges from €69.95-€79.95 in Europe and within the UK £55-£63 based on the shade desired; so they’re a relatively pricey pair of skinny jeans. The most standout thing about the Jack & Jones Premium Ben Classic skinny jeans is that the denim material is heavy duty. We often see skinny jeans that are rather thin and elasticated, which are brilliant in warm weather, but in the colder months your legs will take an undeserved punishing. 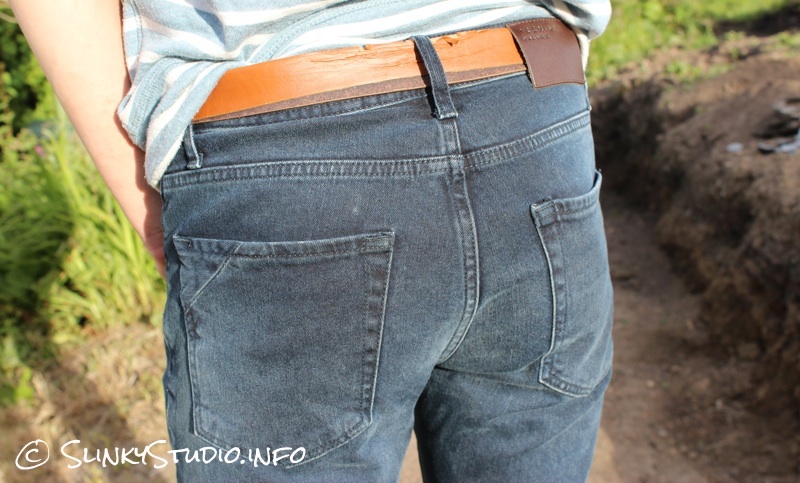 Last autumn we reviewed a pair of the Levi's 510 Super Skinny Jeans, which are also made from heavier duty denim, and in many ways both pairs are catering for similar demographics, but the Levi's 510 go beyond the standard skinny look although offer less variety of shades. Jack & Jones have decided to design these jeans with a low rise fit, with the material tightened around the thigh and knee. The slacker character, coupled with skinny aspects, was not an issue, and our model could move and bend with little restriction due to the 1% elastic. The exterior of the jeans feels soft with a brushed texture, whereas the interior is rougher, but we didn't have any complaint regarding comfort. In terms of the style we like them, the cut looks casual smart, but they don't look too dressy either. They achieve the skinny look when new, but after a good few months of on and off use, the skinny look put on a few pounds. However, the jeans themselves haven't shown signs of wear, with no stitching failure or material snaring. Also the shade we're big fans of didn't noticeably fade or change after being washed several times. Something we're finding with newer skinny jeans is that the pockets sewn into them are getting significantly more cramped. Some of the more elasticated skinny jeans have front pockets in which you cannot even store a smartphone without it actually popping partly out of the pocket. So we were very pleased to see Jack & Jones have sewn in 5 sensibly sized classic styled pockets that will accommodate larger smartphones, a big bunch of keys, coins, etc. The Jack & Jones Premium Ben Classic skinny jeans are for people who want the skinny jeans look in a causal and stylish way. Whilst we feel it’s worth noting that sometimes you’re paying substantially more for a pair of jeans from a designer brand and you could get the exact same cut from a copycat outfit for a fraction of the price, but that these definitely have a unique cut which we have’t seen elsewhere.